Morrissey returns with a new album and various live appearances following a tumultuous period of controversy, whilst Getinthis’ Del Pike assesses the situation and provides a Top 10 for your perusal. Morrissey is back but will the world be listening? With a controversial album cover, a rare London appearance in the diary, a Hollywood Bowl date, Twitter presence and a recent biopic in the bag, could Morrissey finally find much needed redemption in 2017? Your average die hard Smiths fan may be finding these dark days in Morrissey’s career particularly testing. Every time Bigmouth strikes again, it becomes more and more difficult for his devout legion of followers to defend their hero. Back in the 80’s when The Smiths could do literally no wrong, Morrissey’s targets were much clearer cut. Bar the unwelcome respect of David Cameron, the majority of Smiths’ fans tended to sleep on the left side of the bed, so attacks against Thatcher and the monarchy were always going to hit the bulls-eye. Leading an army of carnivores into a life of carrot chomping in the wake of Meat is Murder was too easy, and there stood a figure for the lost and the fey, making the wallflower the new kid on the block. Fast forward 30 years and Morrissey still cuts an attractive figure and his lyrics still manage to seek out their quarry with accuracy. 2014’s World Peace Is None of Your Business included attacks on bullfighters, the Irish penal system, world politics and the pretensions of the art world. The music is fine, more than fine actually, but it’s the comments outside of that sphere that are turning lifelong fans away in droves. Comments like “You can’t help but feel the Chinese are a sub-species” do very little to support Morrissy’s case, even if he is debating the despicable animal cruelty evident in the country. Of London Mayor Sadiq Khan, Morrissey opined “He eats halal-butchered beings, and talks so quickly that people can’t understand him”, can he really be so oblivious to the impact of such comments? Perhaps the hardest pill to swallow came with Morrissey’s admiration of Nigel Farage, described as someone who “respects equal freedom for all people”. This from the man who penned Margaret on the Guillotine. In fairness his comments were made before Farage became the omnipresent race-pest we now know and loathe, but the signs were there. There may be some comfort to be had in Morrissey’s insistence that he is NOT racist and NOT right wing, if we are to believe him. He seems quite obstinate in the fact following various allegations. But with so many inappropriate comments made, it’s a tough call as to whose side to take. Perhaps it’s a case of the man wanting to be seen to be always on the attack, regardless of who his quarry is, and with political lines so blurred right now, maybe he has become blind as to what’s right and what’s left. He’s not that stupid though, right? Critics found it hard to digest the hagiology of Mark Gill’s England is Mine, the recent Brit-flick that chronicled the pre-Smiths life of the young Moz. Not to detract from the quality of the film, the problem lay in the hero worshiping of a figure who so recently has behaved so badly. Never one to be phased by such negativity, Morrissey is returning this autumn with a vengeance. New album Low in High School, due out in November, has a cover that harks back to the good old days with an image of a young boy in a Moz T shirt, wielding an axe at the gates of Buckingham Palace, placard in hand reading “Axe the Monarchy”. Rumours that HMV have refused to stock the release have been squashed by the chain store, could the man himself be behind the ruse. A similar claim was made concerning this year’s The Queen is Dead re-release. Should we be worried by new album tracks named Israel and The Girl from Tel-Aviv who wouldn’t kneel? The lead single, Spent the Day in Bed, it has to be said, is a belter. Recalling the Morrissey of old, the lyrics are a hoot. Morrissey has indeed stayed in bed with himself all day, despite himself not being “his type”??? He has learned to avoid watching the news and warns his friends not to make the same mistake. Lyrically and musically, this is the closest towards The Smiths he has veered in years. His anti-news chant echoes Panic’s “Hang The DJ” chorus and it’s difficult not to laugh along. Sorely missing from this release is the physical copy. Only available as a download we miss out on the opportunity for a new sleeve and B sides, always one of the greatest joys of a Smiths / Moz single. His last album came with an extra disc of tracks that would have been B sides, had he released any singles, so fingers crossed. The single release came with a timely arrival of Morrissey on Twitter. Previously tied to a fax machine in favour of an email account, this may seem terribly modern in the world of Morrissey but we can expect wry comments of varying degrees of controversy no doubt as his tweets unfold. Morrissey’s first tweet… quite simply, “Spent the day in bed“. The BBC clearly are keen to forgive recent crimes as Morrissey kicks off 6 Music’s Live at Maida Vale at the start of October. Performing new album tracks and a few old favourites, Lauren Laverne will host the session along with further appearances from Robert Plant, Alt-J, Loyle Carner and Mogwai. 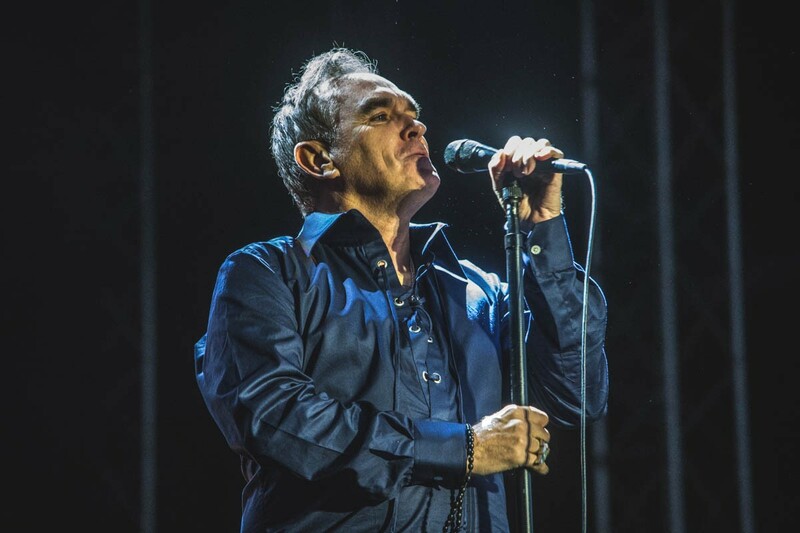 To launch the album Morrissey has announced a series of dates across Seattle, Portland and venues in California, including the iconic Hollywood Bowl. Whether we can forgive Morrissey or not, it is impossible to not appreciate the vast body of work he has produced in the 30 years since The Smith’s split. Whilst his solo career has been given less credit than his Smiths output, he has been solo for six times longer and there are some pure gems in his arsenal. In true Getintothis style we offer you a Top Ten to prove Morrissey’s worth as one of England’s finest artists, we just hope the new album avoids further dodgy political outbursts. Here’s to the past. Morrissey’s fascination with classic British cinema, that permeated both the songs and the cover images of The Smiths’ output made a welcome return here on the opening track of one of his finest solo albums. Including a roll call from the street gang in Graham Greene’s crime novel Brighton Rock, released as a film in 1947, the song was Morrissey’s self-confessed transition into adulthood. The half sombre / half jubilant nature of the song defines the singer’s best work. The harmony between Moz and his band reaches a peak, at odds with the rockabilly approach of the previous Your Arsenal album, with lush arrangements and a voice that has never sounded warmer. The song begins with a warning, “There’s gonna be some trouble, a whole house will need rebuilding” and Morrissey turns to his gang, Dallow, Spicer, Pinkie and Cubitt. It becomes part of Morrissey’s fascination with the criminal elite and the tough, in addition to Last of the Famous International Playboys, Boxers and First of the Gang to Die. Viva Hate was always going to be a gamble. Morrissey’s first post-Smiths album was the classic hard act to follow scenario. Whilst the album contained its fair share of filler, shining moments like Maudlin Street, maintained the lyrical quality of The Smiths’ finest work. With a scenario ripped from the iconic cover art of the band, a working class terraced street, in grainy black and white, you can smell the carbolic soap on the washing line clothes and the home-made dinners drifting through an open window. Its 1960s / 70s Corry with Morrissey as the dour protagonist; (“The world’s ugliest boy” becoming “The world’s ugliest man”), self-depreciating as ever. Each verse brings another scenario dealing with love, shame, death, petty crime and loss. The song should have cemented a career long relationship between Morrissey and Smiths’ producer Stephen Street, hailed as the new Morrissey / Marr, but like the many, Street’s time was limited on the good ship Moz. The song includes Morrissey at his lyrical best and remains as powerful as ever. The early work of The Smiths was defined by Morrissey’s staunch denial of masculinity, the classic compilation Hatful of Hollow served its purpose as a bible for the socially inept, the asexual, “box room rebel”, the latter described by a fan in The Smiths’ South Bank Show. As the years progressed during the final days and throughout Morrissey’s solo career, bombastic production and a new physique made it harder for Morrissey to maintain the fey persona of those golden years. I am not a Man, from his most recent album attempts to reinstate the artist as that crippled figure at odds with the alpha male and is one of the most deeply personal songs heard from him in many a year. After an epic intro sub- Last Night I dreamt that somebody loved me, Morrissey lists the attributes of those men who are clearly still a threat “Don Juan, Picaresque, Wife beater vest, Cold hand, Ice man, Warring cave man”. Morrissey reasons that if this is what it takes to be a man, then he certainly is not in that camp. Themes from The Headmaster Ritual and Meat is Murder crop up as Morrissey tries not to be fearful of potential bullies and sticks to his guns by not “wolfing down a T Bone Steak – Cancer of the Prostate”. Those withering boys may have turned out to be sensitive men, and this is Morrissey’s song for them. Cowering on the flip of one of Morrissey’s least memorable singles, so unmemorable it was pulled from the re-issue of Maladjusted, is Lost. Morrissey can write a great love song, even if they usually deal with loss, as in this case. This is where the Mancunian burr works to its absolute best as he sings of such follies as” Jet trails in the sky” and a “Hand banging into sand”. His driving motif of everybody being “Lost… and pretending they’re not” is a paean to fans if ever there was one. What is so wonderful about Lost is simply the heartfelt delivery that ensures a shiver down the spine on every listen. Not an obvious classic, but proof that much of Morrissey’s best work is hidden away as B-sides. Well worth a listen. Another example of Morrissey putting an absolute blinder at the start of an album. Maladjusted (the album) remains Morrissey’s most maligned release, rather unfairly. There are some excellent songs throughout the album, but this just wasn’t his time. The cover showed Moz without a quiff, dressed casually, squatting uncomfortably and looking dis-interested, lacking any charisma we had come to expect, and this may have been part of the problem. The beautiful sleeves of old acted as a tool to set the scene, this awful shot fails to entice on every level. He is curiously dressed like Corrie’s Tyrone Dobbs on a night out in Nick’s Bistro. Maladjusted the song (Rousingly introduced by Anthony Newley in a Smithsian sample from Cockleshell Heroes (1955)) is perfect, the best opener since The Queen is Dead. Waves of emotion rush through what appears to be a thrumming tale of a lost soul, walking through the streets of SW6, gazing through windows and wishing he/she was lucky. The story can be read as being told by a prostitute (working girl), or possibly one of the rent boys from Piccadilly Palare, who spies a housewife through an open curtain “she stalks the house in a low cut blouse… Oh Christ another stifled Friday Night”. The lyrical delivery reads like a stream of consciousness and whatever the reading, the listener is thrust into yet another piece of realist drama. Much as on Everyday is Like Sunday, this is Moz – the poet Laureatee that never was. Lyrics like “With my hands on my head I flop on your bed / With a head full of dread For all I’ve ever said”, place Morrissey in an unimaginable position and the song becomes another great third person scenario. Aware that his fans may well be maladjusted “Never to be trusted” themselves, he rounds the epic saga off with a kindly repeated re-assurance of “There’s nothing wrong with you”. An incredible song. Another killer (pun intended) B side that easily trumped its brilliant T-Rex Stomping A Side. Lyrically like Maladjusted this is another song concerning a midnight wanderer, falling into the arms of a mysterious street dweller. It’s hard to see if the intention here is sinister or loving, but with a tune arranged as immaculately as this it’s hard to even care. For sheer aural pleasure, it’s those moments when Morrissey sighs, “Crash into my arms, I want you”, when he has never sounded so seductive even if the recipient doesn’t necessarily “agree… or refuse”. I remember hearing this track for the first time and looping it for about an hour, gradually grasping the creeping beauty of it. A personal favourite even if other songs have more widespread appeal. Strangely, a less attractive live version has popped up on compilations instead of this vastly superior recording. The live version omits the finest moment as Morrissey repeats with heavy breath, ”Nobody knows me, Nobody knows me” to the brooding, shattering end. This creepy, almost Victorian approach was also used on The Smiths’ majestic Asleep and to less satisfying effect on the court room drama of Morrissey’s Sorrow will come in the end. Originally written by Morrissey and Stephen Street for inclusion on 1988’s Viva Hate, the song was inexplicably shelved, puzzling when heard next to some of the lesser tracks on that debut album. The song was released that very same year by established object of Moz desire, Sandie Shaw who had previously scored a chart hit with Hand in Glove, an inspired collaboration with The Smiths in 1984. Whilst the production of Shaw’s version is beautifully big and brassy, courtesy of Street, Morrissey’s version that is presented in previously unreleased demo form on the 20th anniversary edition of Bona Drag, is much more subtle and begs the question as to why it was never completed. Ignore the production – enjoy the song. The lyrics are as close to classic comedy-Moz as you can get, as he pleads for someone to knock round to his house before he dies of loneliness “If it’s the weekend then I might be dead, ohhhh!” Once inside Morrissey’s house of mirth, visitors are invited to “note my inside leg”. With its Carry-On imagery, the song sounds much more like a Queen is Dead era Smiths song in the vein of Vicar in a Tutu or Some Girls Are Bigger Than Others. A lost feel-good gem that demands repeated listens. Morrissey’s first outing as a solo artist, the shimmering beautiful Suedehead was unlike anything produced by The Smiths and could possibly be accused of being a little over-produced with the intention of achieving maximum radio play. It’s a fine single however, but in a common scenario in Morrissey’s career, was upstaged by its B sides. Alongside the wondrous I know very well how I got my name and Oh well, I’ll never learn, Hairdresser on Fire is another example of Morrissey delivering genius lyrics to a killer tune. This should have been a single in its own right. Playing audaciously with the dandies of Sloane Square and possibly referencing playwright and Moz hero, Joe Orton’s The Boy Hairdresser, this recalls the early days of The Smiths when Morrissey was playful, artful and flirty whilst retaining a stoic level of detachment. 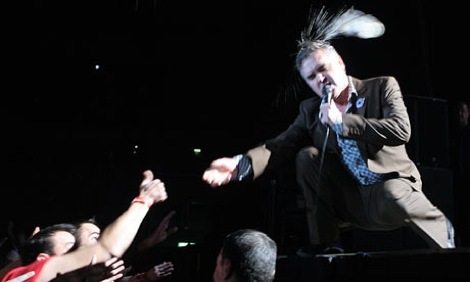 The importance of a hairstyle, referring directly to the trademark Moz quiff is anchored here when the singer begs to be “Squeezed into an empty page of your diary” to be “Psychologically saved / Supernaturally saved.” The hairdresser goes to work with his “Busy scissors / Busy clippers” and along with buzzing sound effects and irresistible hooks the song becomes an instant classic. One of the most fun songs in the canon but still making a fashion statement as only Morrissey can. The new Spent the day in Bed single reminds me of this, a snapshot into the everyday life of Morrissey on his day off. One of the on-going criticisms from non-Morrissey fans, has always been that he is “depressing” but it is only his non-musical comments of recent years that truly fit that bill. We hate it… is one of those excellent songs that finds Morrissey moaning, but in a most delightful way. Yes he may well be disappointed to hear about his friends becoming successful, particularly if they’re “Northern”, but the delivery is tongue in cheek and utterly brilliant. The key to this song is the mocking pantomime laughter that Morrissey injects in place of lyrics in the chorus, stepping up his chuckle muscle gears a notch from the similar guffaws in Bigmouth Strikes Again. The acidic taunts of “If we can destroy them, you bet your life we will destroy them / If we can hurt them.. well we may as well”, remind us of the fact that Morrissey has never suffered fools gladly, and we can only really wonder who this friend is whose success has royally pissed him off so much. A cryptically placed still of Madness’ Chas Smash from their Cardiac Arrest video can be seen in the video for the single. He’s not Northern and to our knowledge was once a good friend of Morrissey, so we can only assume a private joke is being executed. Classic Morrissey making the most of the single format. It was Morrissey’s superior follow up to his debut single and it’s the most typical lyric of his entire career, placing him alongside John Betjeman, Colin MacInnes, Philip Larkin and George Orwell as an articulate British commentator and master of words. The Betjeman comparison rings the truest as every verse, every line, every word paints a perfect picture in reflecting the faded glamour of the British Seaside town. “Trudging slowly over wet sands / to the bench where your clothes were stolen” would be lyric alone to place this song at number one. Imagine Alan Bennett reciting “Hide on the promenade, etch a postcard / how I dearly wish I was not here.” If Morrissey ever wished to rival Bennett in his dry wit and Northern austerity then he has achieved it here in one fell swoop. This was the moment that Smiths fans sighed in relief that their hero had not gone all pop on them and the Grim Up North lyrics of old were still in play (for now). Every bequiffed-Mozphile would give their docs to “share some greased tea” with their hero and help him win “a cheap tray.” Lyrics like this come up once in a lifetime. Everyday is like Sunday is without doubt the song that Morrissey will be most remembered for from his solo career, a song that is equally as strong as the very best of The Smiths and a sad reminder that Morrissey and Street would soon part after a short and incredible relationship. All of those motifs that made The Smiths so different from the rest of their 80s contemporaries can be found here, listen and weep. Morrissey will be appearing on Lauren Laverne’s 6 Music radio show on Monday October 2 and the new album Low in High School is released on November 17. Single, Spent the day in Bed is available now to download.